The bicycle comprises a wrought iron frame, with iron-tyred wheels and wooden non-dished radial spokes in two rows. The cranks and pedals, are attached directly to the front wheel spindle. The pedals have a narrow flat profile with small hanging "acorn"-shaped plumb bob on the underside which always presented a flat face to the rider's foot. The Michaux-type Velocipede, of which this bicycle is an example, combines the straight backbone and rear forks in the one forging, running diagonally from the front socket to the rear axle. The saddle, comprising a padded leather seat, is mounted on a long, single, leaf spring which is secured to the backbone of the bicycle by a pair of curved stays from the rear axle. A lever shoe brake acts on the rear wheel and is operated by rotating the handlebars and tightening a length of metal wire. The handle bars are fitted with wooden hand grips. There are curved leg rests projecting over the front wheel for raising the feet from the fast revolving pedals while coasting downhill. These do not appear to be original. The bicycle finished is in black. After the rise and fall in popularity of the Draisine or Hobby Horse patented in 1818, the idea of a personal form of transport which was inexpensive to buy and maintain and did not bite continued to quietly develop. A number of coachbuilders, blacksmiths, wheelwrights and others contributed to this evolutionary process involving cranks, levers and chains which culminated in the two-wheeled crank driven bicycle, first produced commercially by Pierre Michaux (1813-1883) in Paris. 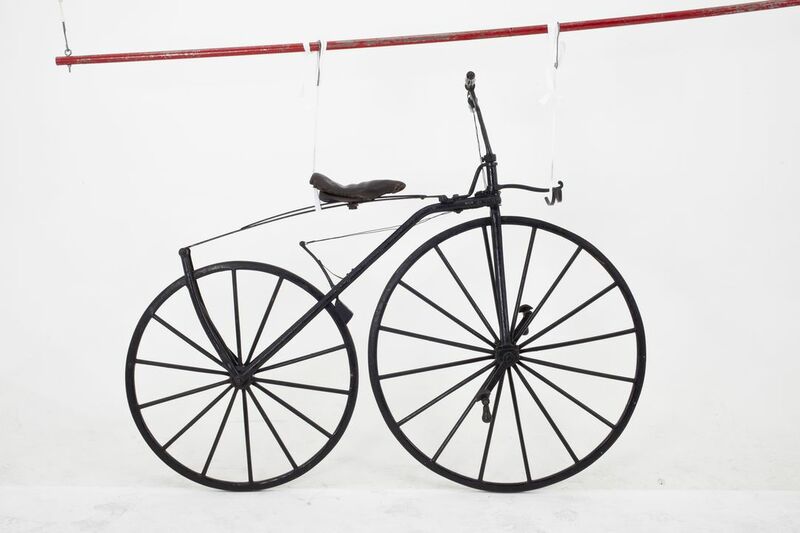 Michaux was a blacksmith and coachbuilder and adapted the Hobby Horse by adding cranks and pedals to the front wheel of a Draisine in 1861 and introduced as the Velocipede at the Paris Exhibition of 1867. As the Velocipede gained in popularity riding schools, clubs and publications on Velocipede-riding were established. Riding a Velocipede was seen as an "art" like riding a horse or dancing. In the United States of America, in 1869 it was even declared the unofficial Year of the Velocipede. Numerous songs were composed including the "Velocipede Galop". In Boston alone there were 20 riding schools operating 24 hours a day. The first recorded track cycle race was ridden on 31 May 1868 at St Cloud, near Paris, followed the next year by the first road race between Paris and Rouen, a distance of 123 miles (198 km). All types of cycles entered including monocycles, tricycles, and quadricycles. Despite this, the Velocipede was not accepted as a road vehicle and was banned from the streets and its use restricted to parks. "The Times" in London described them as the "new terror of the streets". Women also rode Velocipedes but in a side saddle position with a double crank on the front wheel and dress guards added. In France, skirts were soon considered unsuitable and dangerous for riding and instead women wore a "rational dress" of tights and knickerbockers around Paris revealing for the time a scandalous amount of leg. To the English this was seen as both immodest and immoral. The Franco-German War halted production of Velocipedes in France and it was taken up in other countries, especially in England. Velocipedes were not only made in London but especially in Coventry where the Coventry Sewing Machine Co. was among the first to become involved in the new industry. In 1868 the sewing machine trade had slackened off and the city was in a depressed state so the firm decided to make Velocipedes as well, subsequently changing their name to the Coventry Machinists' Company Ltd to account for this diversification. Initially, the Velocipedes were for export but the continuing War saw them sold locally on the British market from 1869 where they became known as a bicycle (or bysicle) by those who took it seriously and boneshaker by those who did not. The best boneshaker wheels had elm stocks, hickory spokes and ash felloes (rims) which were bent in one piece with only one join. Axle bushes were bronze with brass oil reservoirs for lubrication with whale oil. Saddles, pedals, footrests and lamp brackets were sometimes very decorative, despite the added weight, as the manufacturers were often from the horse-drawn vehicle industries. An improvement on the heavy timber wheels were wire spoked suspension wheels patented by Meyer in Paris in 1869. These allowed the spokes to be tightened individually with nuts at the hub. The Boneshaker only lasted until about 1870. Beeley, Serena. "A History of Bicycles", Wellfleet Books, New Jersey, USA, 1992. Clayton, Nick. "Early Bicycles", Shire Publications Ltd, Princes Risbrough, Buckinghamshire, England, 1986. The bicycle was purchased by the Museum in 1954. It was one of nine bicycles and tricycles from the collection of Richard G.J. Nash of Weybridge, Surrey, England. Richard Grainger Jeune Nash (1910-1966) was born in Ireland but grew up in Weybridge, Surrey. During the 1920s he became an automobile engineer at the famous Brooklands racetrack nearby. Brooklands was the world's first purpose-built motor racing circuit and opened in 1907. It was also the venue for early bicycle racing and soon attracted pioneering aviation manufacturing companies as well. In 1932 Nash established a hill climb record in his Frazer Nash, "The Terror", up Brooklands Test Hill. During the 1930s he was actively building up a collection of old aircraft, automobiles and bicycles which was known as the International Horseless Carriage Corporation. In 1939 motor racing ceased at Brooklands and during the Second World War the site was taken over for military aircraft production. The collection was even bombed during 1940. In 1952 Nash offered to sell his entire collection of some 23 veteran cars, 46 pre-1900 bicycles and seven pre-1918 aircraft to the Museum for the "interest and education of future generation(s)" ? "the Empire or Commonwealth". At that time his address was noted as The Beeches, Hangar Hill, Weybridge, Surrey. Nash had family members in Australia and apparently felt his collection would be of value to show the history of technology in the colonies. Because of the prohibitive transport costs from England to Australia, the Museum was only in a position to purchase 9 bicycles from the Nash collection. The Museum's Director, A.R. Penfold, inspected the bicycles in a hangar/store at Brooklands while visiting England in 1953. The bicycles were subsequently shipped to Australia on board the "SS Orion". Unfortunately, the bicycles came with no provenance. Much of the remainder of the Nash collection appears to have been dispersed to museums throughout Britain. After the War civilian aviation continued at Brooklands with several Concordes later being built on the site. After the British Aerospace factory closed in 1986 the Brooklands Museum Trust was formed and a museum of the site opened in 1991.